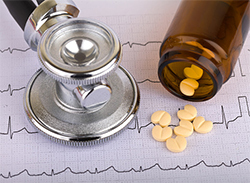 Commonly prescribed anti-coagulants such as warfarin, dabigatran etexilate, or clopidogrel (more widely known by their respective brand names: “Coumadin”, “Pradaxa” and “Plavix”), and even over-the-counter aspirins and NSAIDs (non-steroidal anti-inflammatory drugs like “Advil”) help reduce the chance of a heart attack or stroke by keeping harmful clots from developing in blood vessels. Certain properties inhibit the release of the chemical thromboxane and other critical factors essential to the clotting process. While this can be significantly beneficial for those with a coronary condition or history of coronary-related issues, heavy bleeding due to invasive surgical procedures is a serious risk, as are autoimmune reactions. Because of the probability for adverse side effects, it is critical that patients on anti-coagulants share their medical history with care providers prior to proceeding with any form of health treatment. Although caution must always be used when dealing with patients on blood thinners, the good news is that many such individuals undergo common (and even some complex) dental procedures everyday without suffering any significant complications. Of course, if blood thinners are only being taken temporarily, it may make more sense to hold off on dental work until you have fully recovered, but in most cases, it is safer to undergo care for non-invasive procedures such as teeth cleaning, fillings, and restoration work without halting your medication. Bruising and slightly longer healing times may be expected, but by applying additional post-treatment measures such as fibrin sponges, silk sutures, and medicinal gauzes, your dentist can keep excess bleeding well under control. For more invasive procedures that require oral surgery, such as a wisdom tooth extraction, root canal or dental implant, a consultation between your dentist and physician will be required. Approach for treatment will largely depend on weighing the severity of your dental needs against the nature of your larger health condition, and whether it is safe to pause medication for the surgery. Oftentimes, diagnostic blood tests will be requested to help determine your eligibility for surgery. Anti-coagulants may also come with other oral health risks outside of the dentist’s office. It is not uncommon to experience bruising and/or bleeding of the gums due to brushing and flossing, and injuries to the mouth due to an accident or sports may result in heavier bleeding than normal. See your dentist for changes you may need to make to your personal hygiene and everyday routine in order to help protect your oral health.